I was born in Lannion, in the Côtes d’Armor (Brittany), on July 1976; my parents are artists. My father is a ceramist and I did my first steps in his workshop, playing with small bits of clay, fascinated by clay work, modelling, turning and enamelling. The firing in the kiln, the colour of the clay changing with the temperature, the crackling of the incandescent embers and the hot smell of the fire-proof bricks are my best memories. There is also this crucial moment when the finished piece is drawn from the kiln. From 1991 to 1995, I worked with Xavier Duver, a sculptor, and in the sculpture workshop of Tournon, in Ardèche where I learnt different techniques of modelling, moulding, patina, and discovered that I had a true passion for the figurative sculpture. Then, I stood six years in the Catalonian Pyrenees, in Spain. During those years I deepened my understanding of the clay. 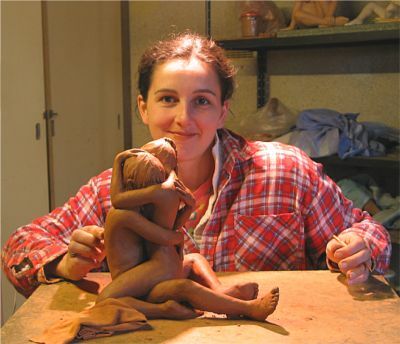 Solenn'Art works on the completion of a sculpture of red clay couple. Since 2003 I totally devote myself to sculpture, in my workshop. I work exclusively with first quality clays, which I import directly from Catalonia. The “chamotte”* clay permits me to realize sculptures composed of much contrasted volumes: one sculpture can concentrate a large mass for the bodies clasped in a fond embrace, and a small mass of clay for the legs or the hands. In such conditions, other types of clay could crack or deform; this one has an excellent behaviour, even during the firing. The red clay for earthenware is very plastic and allows getting a smoother surface. Sometimes, I use stoneware clays; they give a satin-like surface, more fragile during the firing. My technique consists in visualizing a position, possibly helped by a few sketches, then adding bits of clay to shape the bodies. I let the first shape harden for a few days, and then I work on it again, adding clay, modelling and digging it until the bodies become harmonious and slenderer. I often work on several sculptures at once, modelling one and finishing another. When the clay is completely dry, after several weeks, the sculpture can be put into the kiln. Once my kiln is full, I do a first firing so as to dry and eliminate any trace of wetness. Then I bake between 960° and 1 150° (1760 F and 2102 f) depending on the clays used for the sculptures. Later, when the kiln has cooled below 100° (212 F), I can open it and see if all the pieces have resisted. I set a high value upon the surface processing and therefore protect all the sculptures with varnishes, waxes or hardening oils, according to the tint and the satin aspect sought. * Fired and crushed clay added to the ceramic paste to make it less malleable.